CAMBRIDGE, Mass. 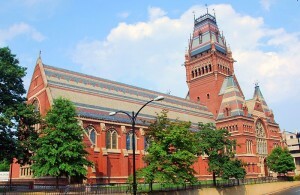 — A student group at Harvard University has canceled a reenactment of an ancient Satanic ritual on campus following outrage and protests from religious groups. As previously reported, Harvard Extension Cultural Studies Club had agreed to allow the New York-based Satanic Temple to perform the Black Mass on Monday during its meeting at Queen’s Head Pub at Memorial Hall. The Satanic Temple is the group known to be behind the “homage to Satan” that has been proposed to be placed adjacent to a Ten Commandments monument at the Oklahoma state capitol. The student club, which was approached by Satanic Temple spokesman Lucien Greaves, said in a statement last week that it viewed the upcoming Black Mass as being an educational experience. Harvard Extension Cultural Studies Club also stated that the ritual, which largely is reflective of witchcraft, is not meant to mock any religion, although it traditionally has been used as a parody of Roman Catholicism. But the event generated outrage from students and religious leaders alike, causing the Harvard Extension Cultural Studies Club to rethink its plans—although it continued to contend that there were misunderstandings about the presentation. President Drew Faust called the Black Mass “abhorrent” on Monday, but said that ultimately, the choice was up to the group regarding whether the event should proceed. Due to mounting uproar, the Harvard Extension Cultural Studies Club sought to move the Black Mass off campus, and at one point, had scheduled the event at Middle East, a bar in Central Square, according to MyFoxBoston. But negotiations soon broke down and the club canceled the event. “The Harvard Extension School is grateful the student group has recognized the strong concerns expressed by members of the Harvard community and beyond,” Dean of Students Robert Neugeboren said. Protests were still held Monday evening surrounding the event .